An old Korean belief states that a person who dies alone will become kaekkvi or a wondering ghost. So, families tried to ensure that some family member is present in the last moments of the dying person. Death is a regular part of everyone's life. We all have to die. We experience deaths of those close to us. Many believe that the death is not the end. Some believe it is the end. Cultures all over the world have numerous traditions concerning death rites. According to anthropologists, death rites include traditions occurring at the time of death and during burial itself. Death rites include religious beliefs, characteristics of local culture, but also many prejudices. Europe like any other part of world has its numerous death rites, meaning traditions at the moment of death, at the funeral and those that exist during period of mourning. In Romanian province of Transylvania people believe that for each person there are his/her own tree and his/her star. The falling of a star symbolically marks the death of a person. Fir is the tree of life. It is put at the head of the grave of a deceased. There are many native American nations. Each of them has numerous traditions concerning death, funerals and mourning. Here are only few of them. The Dakota or Sioux native American people live in North Dakota, South Dakota, Minnesota, Montana and Nebraska. In Canada the Dakota communities exist in Manitoba, Alberta and Saskatchewan. The Dakota painted the face the deceased with red colour. They believed that red was the “colour of life”. Jazz funeral is a type of funeral music tradition from New Orleans, Louisiana. It is a result of numerous European and African influences. Sky burial or jhator (in Tibetan „giving alms to the birds“) is a Tibetan burial custom where a body of the deceased person is cut into small pieces and put on top of a mountain. Body parts are there exposed to the Mahābhūta and animals (especially birds of prey). As to the fact that most of Tibetans are Buddhists, let’s mention that the Mahābhūta (in Sanskrit and Pāli “great element”) in Buddhism are “four great elements” - earth, water, fire and air. Malagan (malangan, malanggan) is a traditional ceremony held in parts of New Ireland province in Papua New Guinea. Malagan is also a name for beautiful wood carvings used in the ceremony. This big ceremony is dedicated to a dead person or more of them who died in recent years. Still it would be wrong to limit Malagan to death and dying. Malagan is also an occasion for initiation rituals, paying debts, solving disputes and making different announcements. Religious beliefs of most Japanese are a combination of Buddhism and Shintoism. But more than 90% percent of all funerals in Japan are organized according to Buddhism. The estimate made by the Japan Statistical Agency in March of 2012 showed that Japan has a population of 127,650,000. The country has an area of only 377,873 square kilometers. Considering this two things it is not strange that almost all the deceased in Japan are cremated. After death there is a ceremony called "Water of the last moment" or "Matsugo-no-mizu" where lips of the deceased are moistened with little bit of water. Chinese funeral has several main traditions. There are Buddhist ceremonies that last at least for 49 days. First 7 days are believed to be the most important. Prayers are said every 7 days for 49 days. If a family of the deceased is poor this period can be short, lasting for only 3 days. Traditionally the daughters of the deceased pay the funeral costs. The head of the family should at least be present at first prayer ceremony, if possible at second prayer ceremony and certainly at the burial or cremation. Fitampoha is one of traditions observed by the Sakalava tribe in the region of Menabe which is located in the west of Madagascar - from Toliara in the south to Sambirano in the north. 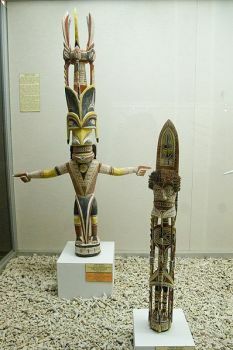 Nowadays there are about 700,000 Sukalava people. In Fitampoha local people celebrate the relics of their dead members of the royal family. Such relics are called Dady. Obon or Bon is more than 500 years old Japanese Buddhist tradition honouring the ancestors' spirits. It is also a time of family reunions. 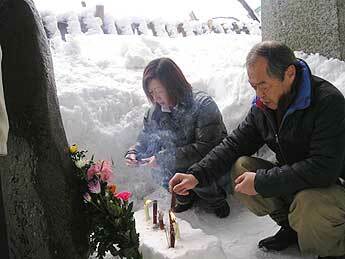 Families visit and clean their ancestors' graves. Obon is also known as the Feast of Lanterns. Africa, from its north to south, from east to west, has huge number of different traditions associated with death. 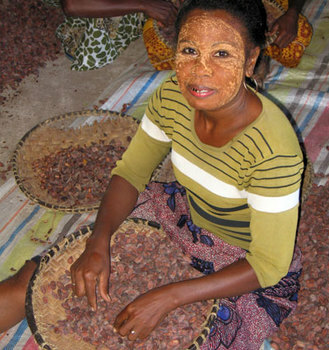 The Ga or Ga-Adangbe people live in Ghana. Most of them are in great Accra plains. They founded Accra, the capital city of Ghana, in the 1500s as a trading port. They believe that when a person dies, he/she moves to another life. Mirila (in local dialect "measurments") are traditional memorials that can be seen on the Velebit mountain, Croatia. They were made by the locals between the 17th and 20th century. People living in small mountain villages had to carry their deceased to the cemetery which was often located quite far away. Half way to the cemetery there was place where they were allowed to stop and relax bit. The Day of the Dead or „El día de los Muertos“ is one of the most popular holidays in Mexico. The holiday includes two days. On the 1st of November or "Día de los Angelitos" (Day of the Little Angels) Mexicans celebrate babies and children. 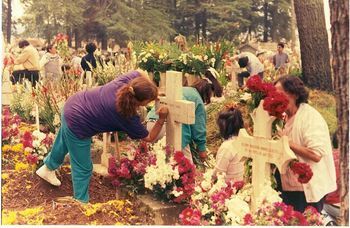 On the 2nd of November or "Día de los Muertos" or "Día de los Difuntos" (Day of the Dead) people of Mexico honour the deceased grown-ups. According to the Hebrew calendar Yahrtzeit (in Jiddish “time (of) year”) is a tradition during which the family remembers its dead relatives. Death anniversary or as it is sometimes called death day is a tradition existing in several Asian countries like Japan, China, India, Korea and Vietnam. It is celebrated on the day some family member or other important individual died. It is connected with ancestor worship, Buddhism and Hinduism.